The Apple Watch's built-in heart rate monitor is 97 percent accurate when detecting the most common form of an abnormal heart rhythm when paired with an algorithm to sort through the data, according to a new study conducted by the University of California, San Francisco and the team behind the Cardiogram app (via TechCrunch). There were 6,158 participants in the study, all of whom used the Cardiogram app on the Apple Watch to monitor their heart rate. Most were known to have normal EKG readings, but 200 suffer from paroxysmal atrial fibrillation (an occasional irregular heartbeat). Data from these participants, along with data taken from normal Cardiogram users, was used to build a neural network that could recognize the abnormal heart rhythms solely from data collected by the Apple Watch. As of today, Cardiogram says its algorithm can almost always successfully determine when a patient is in atrial fibrillation. In order to validate the model, we obtained gold-standard labels of atrial fibrillation from cardioversions. In a cardioversion, a patient experiencing atrial fibrillation is converted back to normal sinus rhythm, either chemically or with a shock to the heart. 51 patients at UCSF agreed to wear an Apple Watch during their cardioversion. We obtained heart rate samples before the procedure, when the patient was in atrial fibrillation, and after, when patient's heart was restored to a normal rhythm. On this validation set, our model performed with an AUC of 0.97, beating existing methods. 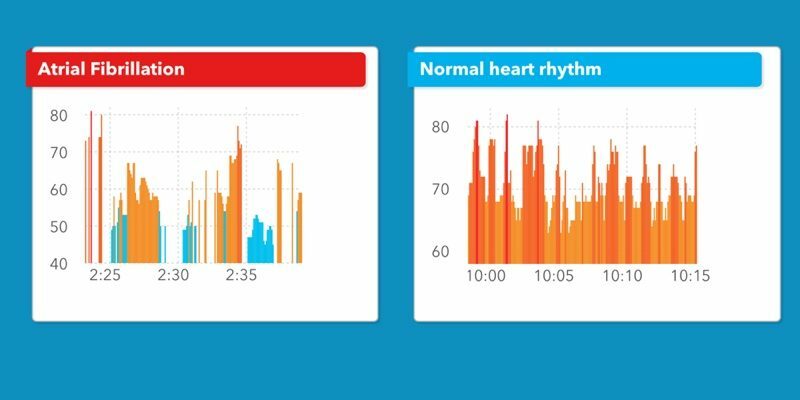 Cardiogram is a startup that's aiming to garner more information from the data collected by the Apple Watch. The study, which Cardiogram has raised funding for, started in March of 2016 and will continue as UCSF and Cardiogram work to refine the neural network and detect other conditions beyond atrial fibrillation. Cardiogram plans to put in additional work before using its algorithm to start notifying Cardiogram users of arrhythmias. The company needs to conduct further testing to make sure the algorithm works in a variety of conditions and it needs to work on scaling it so it can be used continuously by all Cardiogram users. You can program it to delete your browser history if it detects that you are about to die. Siri: "Looks like you're having a heart attack"
Siri: "I'm sorry, Dave. I'm afraid I can't do that." 2) Blood sugar analysis for diabetics. I have a feeling Apple will get there within a decade, fingers crossed. It'll be a long time before this comes to market. And from what it looks like, Apple doesn't want to have to go through the hassle of FDA approval for its devices. does this work with series 1 too? Looking into buying one soon. (Cardiogram developer here) Yes—we're compatible with all Apple Watch hardware as long as you're on watchOS 3. Using a device (A-watch) to tell you when you're heart is skipping beats is like having a device to tell you when you're getting cramps. Every missed heart beat is is easily felt and unpleasant enough as it is without some damn device reminding you of it. I'm an Emergency doctor at UCSF and this could be super useful. We regularly get patients coming to the hospital with atrial fibrillation, and while some swear they know exactly when it started several studies have shown that this just isn't all that successful. Current guidelines allow for electrical cardioversion within 24 hours of onset of atrial fibrillation. If the onset is unknown we have to place a patient on long term anticoagulation (expensive and risk of bleeding with trauma) or do an invasive heart ultrasound with anticoagulation for a few days prior to cardioversion. If we were able to look back at app data/ heart rate monitoring this could save patients and the system a lot of money and time! Glad to see my home institution doing such great work. Now let's make the Watch OHR 97% accurate when running/working out. Yes, it does. I had an A-Fib incident some years ago and was one of the reasons I bought the :apple:Watch. I have been in normal sinus rhythm for nearly 3 years, but generally, once you've had an episode, you are more prone to having another one. Sorry not even close, many strokes are caused by silent AFib with few symptoms. Getting FDA approval for this is difficult. Another Company, Kardia has a Apple Watch band that they have been waiting for a long time. The Apple Watch might soon be that band they wear in Continuum sooner than we think.